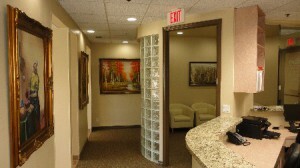 Our Modern, quality Dental Office is located in Boca Raton at Mizner Park Dental. Our Boca Raton Dentists and specialists include a general and cosmetic dentist, a Periodontist, Endodontist, Orthodontist, and an Emergency dentist available to care for your needs. We offer a variety of professionals in one clean, modern setting to eliminate the hassle a patient may have running around finding different specialists for their dental problems. Mizner Park Dental has provided quality dental care in Boca Raton for years. We believe that every patient should receive a good quality treatment, with all your needs, from a routine cleaning to the most complex care involving an elite dental team of cosmetic dentist and dental specialists in one setting. Therefore we have gathered highly skilled, gentle, and experienced dental specialists, dentist, and dental support staff in our Boca Raton dental office. This not only makes it easier for the dentists and specialists to communicate with each other, but also saves patients time, travel, and ultimately money. A Periodontist is a dental professional who received advanced training in the study of periodontal oral care, dental implants, extractions, and periodontal related surgeries. Dr. Hennessy is a local Periodontist in Boca Raton who treats patients who require a dental implant and a professional periodontal care. Dr. Hennessy received his high quality dental education from the New York University school of Dental Medicine. Finally an Endodontist is a dental specialists the is a master of the study of Endodontic and root canal treatments. Endodontics mainly deals with the tooth pulp and the root of the tooth. Endodontist may perform different treatments including surgery to save the patients tooth. Dr. Espanol has great experience in the study of endodontics, as he graduated from well known Nova Southeastern University of Dental Medicine and now serves as a local Endodontist in Boca. An orthodontist, is dentist who specializes in the study and treatment of improper bites. Orthodontists use treatments such as Braces and Aligners to reallign improper bites. The best time to get an orthodontic treatment is as young as possible therefore giving the orthodontic enough options to deal with the issue effectively. Dr. Rubensteen is a local Boca Raton Orthodontist, who graduated from the honorable Harvard School of Medicine.